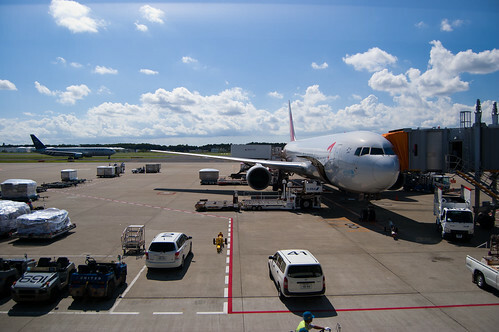 This is the last entry in my Japan trip blog series. I hope you've enjoyed it so far, and thanks for reading! After this I'll probably start an even more irregularly updated blog (mainly photos) from my adventures in Korea, so look forward to that! My last full day in Japan. I thought it couldn't get any warmer, but it did. Thankfully, the only items on my to-do list was to check out the Yebisu Beer Museum and to grab dinner with my host, Masashi, so I wasn't going to be strapped for time. I ran into a police booth near Ebisu station, and a young police officer recommended an udon restaurant nearby for lunch. It was a bit of a walk away and the opposite direction from the beer museum, but no problem, it was only hot as hell out! I walked through a part of Ebisu that reminded me a lot of the no-name town my grandparents used to live in. Wide, multi-lane 'major' streets with practically no cars on them. Small one- or two-story shops of all sorts lining the streetside, some of them dilapidated, some of them not even open despite it being almost noon on a weekday. Behind them, apartment buildings and offices a few floors taller connected via small, back-alley roads. Businessmen and women walked around in small groups here and there, but it was still very quiet, and somewhat nostalgic. After a bit of walking I found the wonderfully AC'ed udon restaurant, which I walked into with a shirt drenched with sweat. 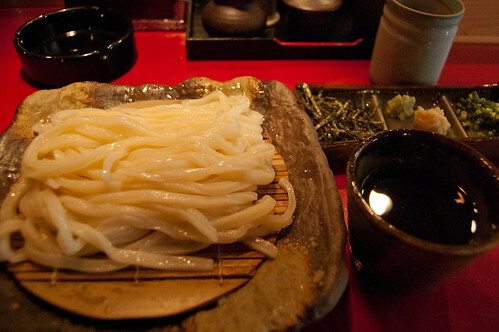 The somewhat hyperactive waitress there recommended the zaru udon (*point at menu* 'Mmm, good!' *thumbs up*). It was delicious. After cooling myself in the restaurant for a bit longer, I headed towards the beer museum. Through the Ebisu station, there was a long series of moving walkways towards the Yebisu Garden Place, which made me feel like I was at an airport. I highly recommend it if you go to Ebisu. Exit station, take walkway to beer museum, drink beer, take walkway back to station, leave Ebisu. The Yebisu beers here were 400 yen a glass, which is a steal if you ask me. 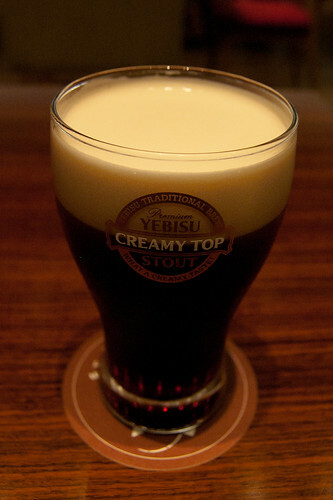 Of the selection, I liked the Yebisu Creamy Top Stout the most, but even that wasn't that good as far as stouts or porters go. Regardless, it was a great place to rest and take refuge from the stupid heat outside. I think I chilled at the beer museum for three or four hours before heading back home to meet up with Masashi. We were then on our way to a local sushi restaurant which I was told to be 'affordable and good.' And it was! Sushi, beer, and sake! PS Could someone help me identify the sushi pieces in this picture and the other sushi pictures? I don't really know what I was eating. I just ate it because it tasted good. After a satisfying meal and a few more glasses of beer at another local bar, Masashi and I headed back. I made it to my gate with less than half an hour to spare, but that was enough time to let me enjoy the last view of Japan from the ground for this trip. It was another beautiful day out, made infinitely better by the fact that I didn't have to deal with the stupid heat outside. The plane was probably one of the oldest planes in Asiana's fleet. At least I would hope so. There were so many scratches and dents on the window that I was hesitant to shoot pictures out of it. Also no personal interactive entertainment system meant that I wouldn't be able to finish the movie I got half-way through on the plane to Japan. Bummer. I suppose those are minor gripes though, since the plane itself worked fine. 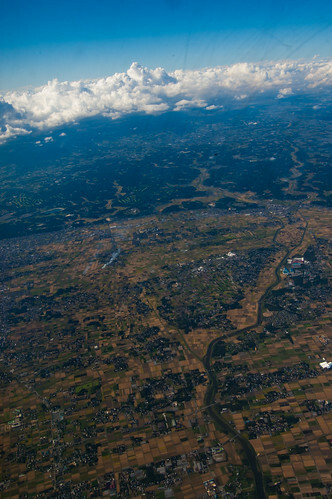 After an uneventful takeoff, I said goodbye to Japan as we banked, and drifted off to sleep. My last photo of Japan. A wonderful journey, but missing one thing! Enjoyed the whole thing a lot. One of the best "mini-blogs" i have read recently! Pictures were fantastic and seems like you had a great time! Can't wait for the Korean blog next. Thank you! It looks like you had a amazing trip! I'll be sure to check out the rest of the parts to see what I missed. Your Mcdonalds in Japan looks better then the Mcdonalds we have over here. so hungry right now T.T. The sushi is obviously on the bottom row: shrimp, egg roll, salmon, and cucumber (kappa maki - be careful of your belly button), and the top row the red fish is maguro tuna but I don't know what the white fish is, it could be anything. unagi is eel btw, and its in one of your other pictures, the one with the cooked fish with the sweet brown sauce on. I know the yellow one is "Tamago" that was always my favorite as a kid, which is like a sweet egg omelette ish sort of thing. And then Cucumber rolls on the right. 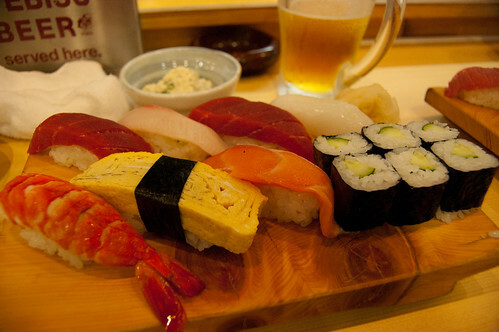 Thats the best picture I can give to figure some of the rest out, I really only know of Unagi and Tamago. Anyone know around how much I would have to save up to have a trip like this? I would hate to go and not know if I will have enough money for the next day. Haha, nice McDonald's ;D Looks so good! God, the food looks amazing, but the dishes also look very nice. That sort of stone plate for the noodles is so suiting! No pictures of mermin crying. 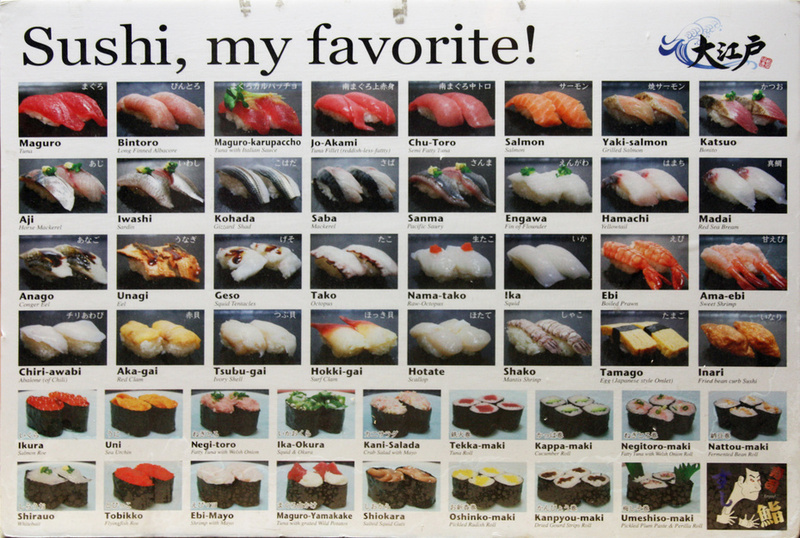 And thanks for all the help with identifying the different sushi pieces. I actually got two different types of unagi. I was simply told that they were completely different species, and that one swims up river during mating season and the other stays in the ocean (or something like that). I spent around $800 USD during the 10 days, excluding airplane tickets and housing. I didn't buy many souvenirs and didn't eat lots of fancy/expensive food all the time, so you'll have to adjust accordingly. Yea, lots of Japanese restaurants go what I feel is an extra step to try and up the food's presentation. Makes the food look a lot more fancy and expensive than they actually are, which I don't mind! I sure did! Hoping to go back once more before I leave Asia next year! Amazing series of blogs. Thanks for sharing all of this with us, MrMin! Ya, I absolutely adore it. There's a restaurant near me that fluff up their sushi plates a lot and like to sort of make everything look like perfection. No complaints, I adore it. 10 great blogs in a row. Someday i'd love to travel a bit, probably have to work a couple years to save up first. And the cucumber is Kappa.